An imposing and sympathetically restored 4 bedroom period house together with a fine oak framed workshop, formal gardens and pasture land, the whole extending to about 3.27acres. A converted 2 bedroom self-contained cottage with adjoining stables/stores with potential for conversion, All weather tennis court. Also available an additional 7.3 acres of pasture land adjoining the homestead. Standing in an enviable position on the western slopes of The Clwydian Hills with outstanding panoramic views across The Vale towards Snowdonia, The North Wales Coast and southwards towards The Berwyn Mountains. Fron Isaf stands amidst rolling countryside in an elevated position off a minor country lane, overlooking the hamlet of Pentrecelyn and beyond. It has breathtaking views along the length of The Vale and towards Snowdonia. The house dates from the early 19th century and has a large and versatile floor plan with elegant rooms arranged around a fine reception hall and a particularly large landing. It has been restored and refurbished by the owners over many years, combining original features including sash windows with shutters in the main. The house has modern amenities including a bio-mass wood pellet heating system which serves the house, cottage and workshop. In addition the house has photo-voltaic and solar heating. The house stands within landscaped, mainly westerly facing gardens with lawns and an established kitchen garden. The Cottage is a former period barn converted to provide an independent and self-contained two bedroom house with delightful south westerly views across The Vale. In addition the adjoining two storey building providing stables and stores, and loft room over, which could readily be converted to provide a larger house. The Workshop is a restored oak framed cruck building currently used as a large workshop with loft study. It has 3 phase electricity and bio-mass heating. 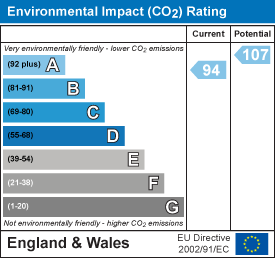 The property is eligible for RHI and FIT payments for the heating and solar energy system. Pentrecelyn is a small rural hamlet standing on the western slopes of the Clwydian Hills some 4 miles from the market town of Ruthin. There is a local primary school, and Ruthin town centre provides a range of shopping facilities catering for most daily needs, secondary schools and leisure facilities. Cottage style window to front with stone sill, impressive stone lined chimney breast with a Villager freestanding cast-iron multi-fuel stove, fitted display cabinets to either side, turned staircase rising off and panelled radiator. Secondary window overlooking the conservatory. Fitted cupboard housing the controls for the biomass heating system which extends throughout the house, cottage and barn. White suite comprising wash basin with tiled splashback, low level WC, double glazed window and red tiled floor. A light and airy room with two large Georgian style sash windows with shutters and low level window seats, with westerly views along The Vale towards and Snowdonia. High and coved ceiling, slate fireplace and hearth with inset Jetmaster stove and a fine yellow pine surround. Wall light points and two panelled radiators. Arched and glazed window with central opening section to the garden room. Designed to take full advantage of the splendid south and westerly views across The Vale and towards Snowdonia with three-quarter depth double glazed windows and a high vaulted double glazed roof with screen blinds to the southern side. Tiled floor and low level radiator. Double glazed window to the north east elevation, fitted book shelves and cabinet. Enclosed fireplace with timber fire surround (flue not in use), telephone point and panelled radiator. Splendid stone slab floor, stone lined fireplace with raised hearth and an ornate green enamelled Trolla stove. Sash window with shutters facing south west. Ornate arched display niche with cabinet and panelled radiator. A large and airy room with two Georgian style sash windows with shutters, fitted with a range of base and wall mounted cupboards and drawers to an oak style finish with roll edged working surfaces. Green enamelled electric AGA with twin hot plates and ovens, electric cooker point, void and plumbing for dishwasher, inset single drainer sink and panelled radiator. Pine boarded floor with a large two section hatch to a concealed cellar. Open tread steps leading down from kitchen, fitted wine bins. With fitted base unit, inset sink, plumbing for washing machine, wall cabinets, extractor fan, tiled floor, double glazed windows and door to the south westerly elevation. A large and adaptable landing with study area, walk-in cupboard with shelving, large walk-in airing cupboard with a pressurised cylinder with immersion heater and slatted shelving, south westerly facing window with shutters, easterly facing double glazed window, and panelled radiator. A large room with two windows affording dual aspect to both the south and west with fitted shutters and low level sill. Radiator. Two built-in double door wardrobes and locker storage cupboards over, easterly facing double glazed window and panelled radiator. 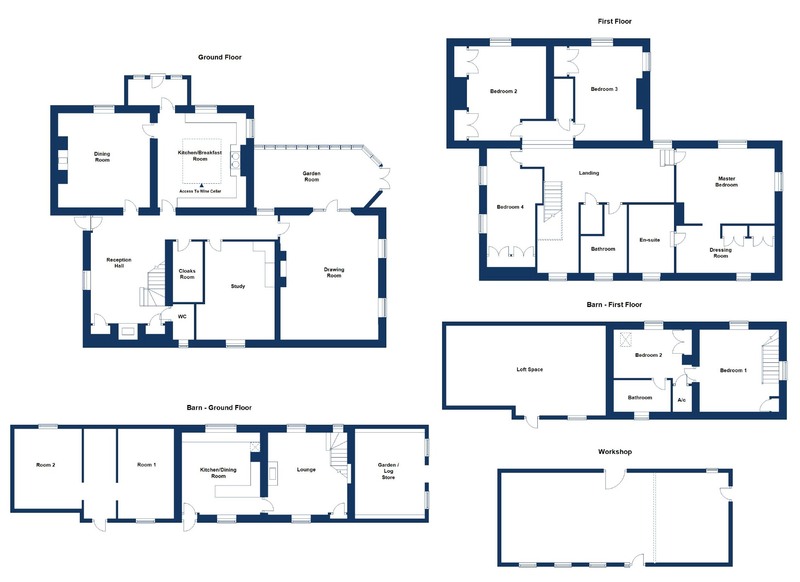 White suite comprising panelled bath with combination shower/tap unit, large and separate walk-in shower cubicle with high output valve, fitted cabinet with bowl and low level WC. Double glazed window, coved ceiling, downlighters, extractor fan and panelled radiator. South westerly facing sash window with shutters and window seat, two double door fitted wardrobes with locker storage cupboards over, ornate cast-iron fireplace with white painted surround and stone hearth (not in use) and panelled radiator. Dual aspect sash windows with shutters and window seats, one due west and the other south west. Built-in double door wardrobe with locker storage cupboard over, ornate cast-iron fireplace with white painted surround and stone hearth (not in use) and panelled radiator. Two low level windows with deep sills, two built-in double door wardrobes with storage over and panelled radiator. Modern white suite comprising shaped bath with glazed screen and high output shower over, pedestal wash basin with tiled splashback and low level wc, ceiling downlighters, extractor fan, dado rail and radiator. An historic oak framed and cruck style building with two very impressive wall and ceiling beams to an 'A' frame truss with exposed purlins, wall panelling and cottage style windows. It has been designed as a workshop with a split level concrete floor, 3-phase electricity and heating from the biomass heating, and panelled radiator. Access to an upper loft area/study with exposed 'A' frame truss beams and gable window with pleasing westerly aspect. The property stands within grounds and land extending to about 11.23 Acres in total. It is approached over a long, private tarmacadam drive with cattle grid entrance bounded to one side by a fine dry stone wall, and leading down to the southern side of the house where there is ample space for parking and access to an open fronted and detached double garage/car port. The gardens are mainly to the western elevation of the house approached via brick paved pathways, shaped lawns with established and well stocked flower and shrub borders, and from which there are truly outstanding southerly and westerly views along The Vale towards Ruthin, Snowdonia and beyond. The house, gardens and adjoining paddock extend in total to about 3.46 acres, with a separate gate access from the lane leading to the paddock. The land is to the western side of the house with open aspect and far reaching views. It provides permanent pasture ideal for livestock and horses. A delightful 2 bedroom converted Barn providing ideal accommodation for a dependant relative, long term rental or as a holiday cottage. The adjoining building providing stables, store and loft room over would lend itself for conversion for additional accommodation subject to consent. Fitted with a range of base and wall mounted cupboards and drawers with a combination of solid oak and a painted finish to door and drawer fronts and contrasting stone effect working surfaces to include a double drainer stainless steel sink with mixer tap, LPG and electric cooker point with stainless steel hood over, space for fridge, open shelving and a peninsula room divider. Ceiling downlighters, central beam, two double glazed window, one with tiled sill and pleasing south westerly views, and panelled radiator. A well lit room with three double glazed windows, two benefitting from far reaching south-westerly views, turned staircase rising off, fitted cupboard, display niche, raised hearth with a Villager multi-fuel fire grate, TV point and panelled radiator. High vaulted ceiling with exposed purlins and two low level double glazed windows with far reaching views. Fitted wardrobe with hanging rail and panelled radiator. Low level double glazed window with south-westerly aspect, partially vaulted ceiling with velux roof light and exposed purlin, fitted double door wardrobe with cupboard over and radiator. Walk-in airing cupboard with slatted shelving, pre-lagged cylinder and the controls for the biomass heating system. Modern white suite comprising panelled bath with glazed screen and high output shower over, pedestal wash basin with tiled splashback and low level WC. Extractor fan, vaulted ceiling with downlighters and radiator. 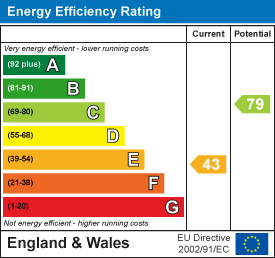 There is an Energy Performance Certificate for this property, with an Energy Efficiency Rating of F. Further details can be obtained from the Agent's Ruthin Office. Adjoining is a further and substantial barn providing potential for stables. Central section with access via a ladder to loft above. There is a private and sheltered kitchen garden with established soft fruits, canes and bushes, and fruit trees. Timber framed and panelled garden shed. Purpose-built outbuilding clad in weatherboard. It provides a large 56 Kw biomass boiler with pellet store to one side. The system provides domestic hot water and heating to the House and The Cottage, and heating to The Workshop. An enclosed purpose-built and all-weather tennis court is located adjoining the lower garden. An adjoining parcel of land extending to about 7.33 acres is available by separate negotiation. Benefitting from extensive road frontage and gate access from Fron Isaf and the adopted highway. We understand a right of way exists along the main drive for a landowner to gain access to land beyond Fron Isaf, details of which are available from the agents. From the Agent's Ruthin Office proceed down Well Street and on reaching the junction with Station Road bear right and follow the road out of town for some 2 miles. On entering the village of Llanfair DC continue past the White Horse Inn and take the left turning signposted Graigfechan. Follow the country lane to the staggered crossroads and turn right and continue on the B5429 into Graigfechan. Follow the road through the village centre and take the left fork which leads out of the village towards Llandegla. Continue for about 0.5 mile and in the dip in the road just after a small bridge, turn right and the entrance to the property is immediately on the left over a cattle grid. Please note: If using satellite navigation, please ensure you turn down the hill at the crossroads. Denbighshire County Council. The House - Council Tax Band G. The Barn - Council Tax Band C.